I always get a little excited when I pop open a blue Adnams bottle – I’ve enjoyed many of their beers in the past – so have real confidence in ones that I’ve yet to try. Ghost Ship Pale Ale is no different to others in the stable – visually it’s clean with good clarity – a lovely golden amber colour with a good frothy head and good lacing. To the nose it has got lovely grapefruit and citrusy aromas with excellent fruitiness coming from the hops. The taste is delicious with lovely soft fresh citrus and grapefruit flavours with a melt in the mouth caramel maltiness – there’s a good balance of pithy bitterness that lingers after each sip – commanding me to take yet another sip! It’s got soft and just enough carbonation – that gives it enough crispness – making it lovely and refreshing. Perfect with a spicy light lunch. Adnams Ghost Ship 4.5% ABV is part of our Permanaent Range available all year round on draught and in bottles. 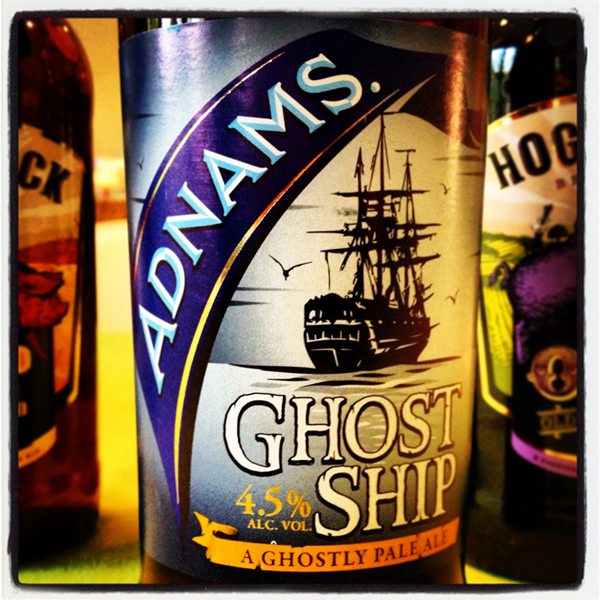 Ghost Ship is a ghostly pale ale which takes its inspiration from Adnams 600-year-old haunted pub, The Bell. As well as having its own resident ghost, The Bell sits in one of England’s most haunted villages, Walberswick, where George Orwell famously spotted the spectre of a small stooping man, prompting a lifelong interest in ghosts. Walberswick’s shore is littered with the eerie wrecks of smuggling ships, much like the one on the pump clip. And just out to sea, now under the waves, lies the ghost town of Dunwich. Previously one of England’s biggest ports, Dunwich was washed out to sea in 1286.